Being to gardening what Madonna is to non-ferrous arc welding, I'm always on the lookout for realistic looking greenery in the garden that will survive my expertise. If it grows quickly and can be eaten afterwards, all the better. Last year I grew a wodge of parsley from a packet of seeds. The experiment worked splendidly - growth was prolific and even in December, there is plenty of growth. 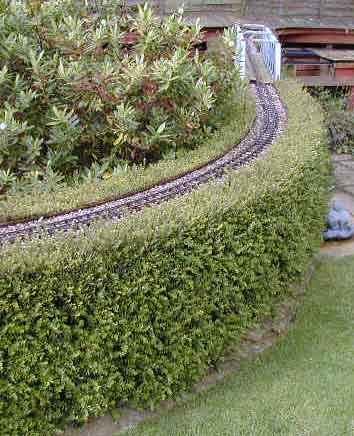 But the most important thing is that it looks right - like 16mm scale bushes or small trees. This year, I will continue in this direction, encouraged. The mention of Parsley for a 16mm layout brings me back to my previous comment on 'Baby's Tears'. I am still in the process of removing it from my layout as, any period away from home results in massive overgrowth. What I have discovered is that at the time I originally planted it I also planted a few pieces of Pratia. This is a very similar sized (scale) ground cover but is nothing like so invasive as Baby's Tears. Pratia has another advantage in that it produces little blue starlike flowers in early summer. I have decided to extend my plantings of that - combined with some Parsley, of course ! Glad to hear that a little Aussie escapee is growing well in the UK. Pratia is a very good ground cover around the garden railway line. Not too dense growing and easily cut by the loco wheels on the first train after a period of the line out of use. There are 2 varieties of flower colour - blue and white. Theyhave different botanical second names and both are hardy. I have used parsley and it's worked very well. Only lasts 2 years though. Flowers and that's it. Mind you if you cut out the bud it will last longer. I have also used Chamomile which makes a good Bracken. See attached photo of my hedge made from Lonicera (don't know which variety). I grew it from cuttings and layering (bend the tip of a young branch over and plant in a small pot of soil). OK it takes a bit longer than buying established plants but it's FREE. The only delay will be from the cutting state to the size you can get from a garden centre - after that, they'll soon take off. What I did was to fix horizontal wires to the railway posts and train the branches to these - thus helping to thicken it up in the process and also to prevent lots of 'single' bushes. The latter is a real pain when trimming as a single bush will pull away from the others when the hedge trimmer is applied. Intertwining a bush with its neighbour prevents this happening.